Handicraft by Agis: Unicorn embroidery! 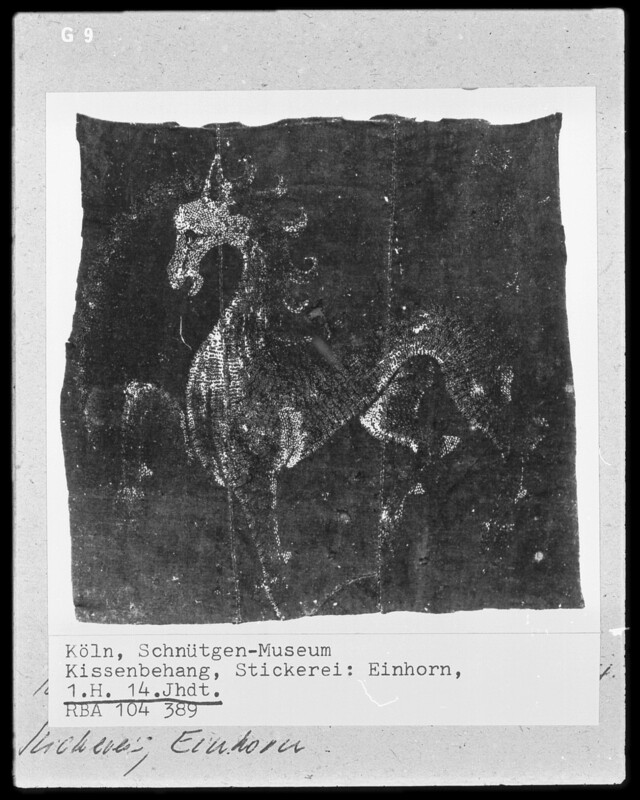 My latest embroidery project is based on this gorgeous 14th century unicorn embroidery, from Köln in Germany. My version is done on a piece of pink linnen and is meant to be stitched onto my 14th century outfit. I am using split stitches, letting the needle pass through the thread, creating a very smooth surface. This is the first time I've worked with this type of stitch and I think I'm starting to get a hang of it. I should however admit that I made a silly beginner's mistake as I transferred the pattern... Despite me being careful when tracing the lines, they ended up just a millimeter or so outside of the template, which I didn't actually realize until after I'd done most of the head. At that point, when I noticed that my unicorn wasn't as slender as the original, it was already too late to go back without ruining it all. I just hope that it'll still look good in the end. Though I am really an archaeologist (master's degree from Uppsala University), at the moment I have a much less inspiring day job selling insurances, which basically just pays the bills. But what's even better, I have no problem sewing or needlebinding while at the same time doing my job! Actually, I feel that having that distraction helps me keep sane and focused, and helps me perform damn well. The last picture hints of my favourite work position: laid back with my feet up on the desk with my embroidery in the lap, and the computor running next to me. At first I got some weird looks from the others, my bosses especially wondering if I could really concentrate on my job while at the same time doing all this other stuff! Now they don't even raise an eyebrow when I pick it up, and I can do my thing in peace. So yes, I do like my work, and I don't think I've EVER gotten so much hand sewing done before! What a lovely unicorn, it will look lovely on your outfit!